According to the CDC, motor vehicle accidents are a leading cause of child deaths here in Massachusetts, Rhode Island and across the United States. In busy tourist towns like New Bedford, Providence and Warren these numbers can increase during the summer months due to an influx of, multitasking parents, dangerously hot weather conditions, and distracted drivers heading to places like Roger Williams Zoo, Battleship Cove or to catch an outdoor concert over at Bold Point Park in East Providence. Here are some child passenger safety tips help your family have a safe and happy summer vacation. 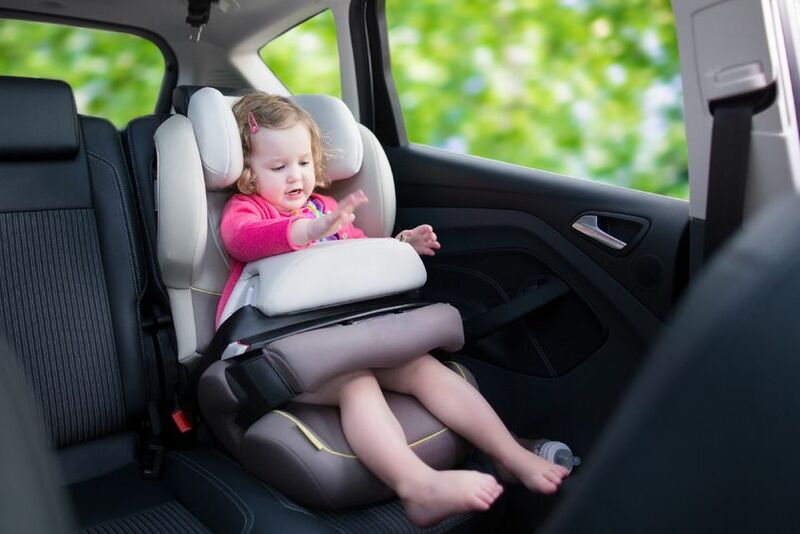 Children must be in a federally approved child passenger restraint that is properly fastened and secured until they are 8 years old OR over 57″ tall. Rear-facing Seats in the back seat from birth to at least 1 year old and at least 20 pounds. Booster Seats in the back seat from about age 4 to at least age 8, unless 4’9″ tall. Safety Belts at age 8 and older or taller than 4’9″ (or 57 inches). All children age 12 and under should ride in the back seat. We read about it in the news all too often, but people do leave there children in their hot car through actually forgetting about them or just irresponsibly deciding that they will be okay for a while. According to recent recent reports by the safety organization Kids and Cars, an average of 37 children die in the United States each year due to being left in a hot car. One of the most common types of driving distractions can be your passengers and that goes double when those passengers are your children. Parenting from the driver seat can take your attention off of the road and cause a car accident, auto-pedestrian accident or auto-bicycle accident. For the safety of yourself, your children and others on the road, make sure to have your children properly fastened in with everything they may need before you head out on the road. We hope that these tips keep you and your family safe, but you can’t account for the behavior of other drivers on the road. If you or a loved one have been the victim of any type of a motor vehicle accident due to a distracted driver’s negligence, contact us to speak with one of our experienced attorneys. We’ll help you to get the settlement that you deserve and help you and your family to move on after your accident.